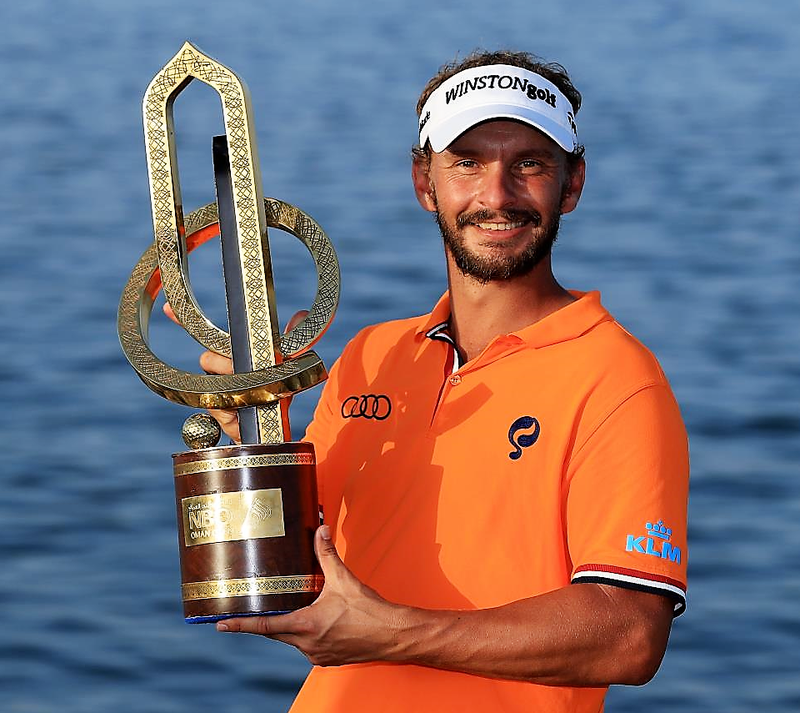 Al Mouj Golf has played host to some dramatic scenes on the Challenge Tour, hosting the season-ending NBO Golf Classic Grand Final, and did not disappoint on its European Tour debut. Perfect conditions greeted the players for the fourth day in a row, with Luiten going out in the final group and holding a share of the overnight lead. There were ten players within four shots of the lead as the final group reached the turn but it evolved into a shoot-out between Luiten and Wood on the back nine, with the experienced duo going toe-to-toe in the desert. It was the Dutchman who prevailed, carding a 68 to get to 16 under 272 and finish two shots ahead of his English rival who closed with a 69 for 274. Luiten earned 233,235 euros; Wood 155,490 euros. Frenchman Julien Guerrier finished third at 13 under after a 71, two shots clear of Spaniard Jorge Campiilo, Frenchman Alexander Levy and American Han Seung-su. The victory is Luiten's first since he won his home event for the second time at the KLM Open in 2016 and moves him into the top ten of the Race to Dubai Rankings presented by Rolex, earning him a spot in the WGC - Mexico Championship. "This is why you play golf, to hold trophies," he said. "It's been a great week. "It's always tough to win out here, all these guys are so good and they keep putting pressure on you. "Down the stretch I hit some nice shots, I made some nice putts and it was a nice battle with my friend Woody. For Wood, the runners-up finish represents a welcome return to form after he had missed his first three cuts of the season. A bogey-bogey finish on Saturday dropped Wood out of the lead but a smart approach into the first quickly had him into a share of top spot alongside Luiten. Luiten then hit a perfect drive on the second and that allowed him to get close and make a birdie and he was soon three ahead. The 32 year old stretched his advantage to two shots when he holed from the fringe on the third and an approach to tap-in range on the next gave him a seemingly comfortable cushion. Wood rolled in a 15-footer on the sixth to make himself Luiten's nearest challenger and the leader made his first mistake of the day when he three-putted from off the green on the seventh after laying up. Another three-putt on the next led to another bogey and dropped Luiten into a share of the lead with Wood. The 2016 Ryder Cup player got up and down from the sand on the 12th to lead on his own but Luiten also took advantage of the par five and when he holed a 15-footer on the par three next, he was back ahead. A beautiful bunker shot on the 16th set up another birdie for Wood and it was now a two-horse race between the leading duo. Luiten holed a 25-footer on the par five to get his nose in front and when Wood dropped a shot ahead on the 17th after a poor tee-shot, Luiten was in control. Guerrier matched his best European Tour finish from the 2014 Madeira Islands Open – Portugal – BPI as he bounced back from bogeys on the ninth and tenth with birdies on the 12th, 14th and 16th. Campillo and Han both signed for rounds of 68, with Levy carding a 70 to sit a shot ahead of England's Robert Rock and Paraguayan Fabrizio Zanotti. Scot Stephen Gallacher, Frenchman Benjamin Hebert and England's Matthew Southgate were then at nine under. Gallacher finished T9 on 279 and earned 28,362 euros. On the same mark was Matthew Southgate who was in contention with a round to got but closed with a 75. David Drysdale was the second best Scot with four steady rounds of 72, 70, 70 and 71 for 283 and a T23 finish. The Dunbar marn earned 14,974 euros. Paul Lawrie finished T61 after a four-over par last round of 76 to tag on to scores of 71, 73 and 72. His total of 292 placed him T61 and earned the Aberdonian 3,709 euros. Bradley Neil from Blairgowrie and Marc Warren tied for 63rd place on 294. Neil had scores of 74, 69, 79 and 72, Warren 69 72 80 and 73. They both earned 3,429 euros.